With Wimbledon about to kick off, once again, we find ourselves with less time than we'd like to handicap the ladies' draw of a major, but our picks are both thought-through and binding nonetheless. What follows is our take on the 2012 Wimbledon ladies' brackets, the matches worth catching ESPN3 for and your next Wimbledon champion. The BLT take on the Wimbledon ladies' draw commences after the jump. Maria Sharapova's win at Roland Garros proved beyond a shadow of a doubt that she had successfully come back from her years wandering in the tennis wilderness following a 2008 shoulder surgery. Unless she hasn't finished celbrating her Career Grand Slam, she'll get past Anastasia Rodionova, before facing a serious grasscourt savant in Bulgaria's Tsvetana Pironkova in the second round. The first seed Sharapova could encounter is powder puff serving Monica Niculescu (seriously look up the stats, her 1st serves might not break an egg--even if she was serving the eggs themselves). Potential challengers to Sharapova in this section include a couple of young Americans: Sloane Stephens and 28th seeded Christina McHale. This quarter also houses Sabine Lisicki, Sharapova's likely Round of 16 opponent, as well the incredible slumping Russian Vera Zvonareva, the incredible slumping Serb Jelena Jankovic, and surging German 8th seed Angelique Kerber. Also here is Ekaterina Makarova and the walking wounded aka Kim Clijsters, all five are on the other side with McHale to face the Sharapova/Lisicki winner. Agnieszka Radwanska and Samantha Stosur lead another loaded section of the bracket. Each open with thoroughly winnable matches before the road gets decidely tougher. For Radwanska to get to the semifinals, she'll then have to get past five time champion Venus Williams or Elena Vesnina in round two, the ageless Daniela Hantuchova in the third round and then either a surging Melanie Oudin, Flavia Pennetta, the always in the mix Nadia Petrova or Timea Babos (we like Petrova) in the fourth. Stosur should glide past Carla Suarez-Navarro on grass versus her favored clay, Arantxa Rus and a capable Shuai Peng then she could be tasked with taking on the winner of Na Li/Li Na and Ksenia Pervak. 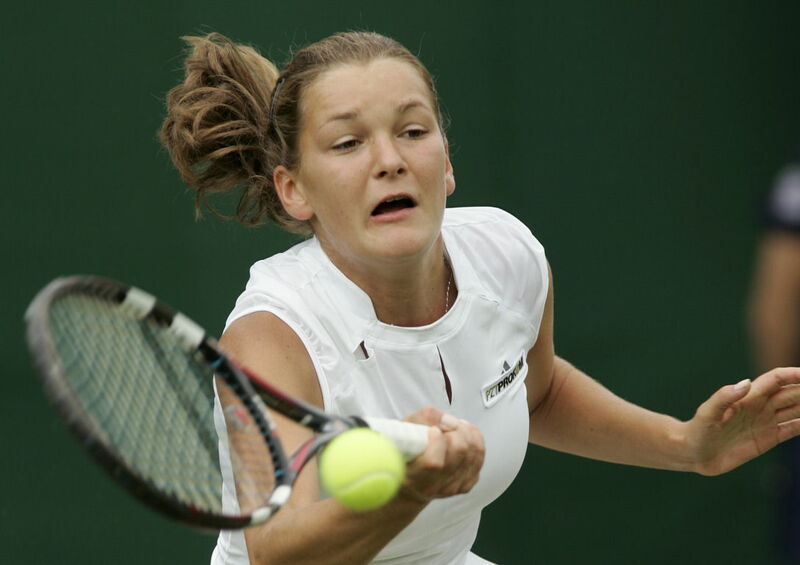 If not, Stosur's next foe will likely be Maria Kirilenko. The Russian could waltz her way through a relatively open section to a tilt with Stosue. If it's an in-form Li, or (especially) Kirilenko, Stosur should consider her sets numbered. The last two Wimbledon champions, Petra Kvitova (2011) and Serena Williams (2010 B.G. - Before Glass) stalk this STACKED quarter of the draw from opposite ends. At the top Williams is looking to avenge her earliest ever major event defeat by drubbing Barbora Zahlavova-Strycova in the first round. If she can put away that fresh demon, Williams shouldn't be seriously troubled again until she faces faces either doubles queenpin and Roland Garros singles quarterfinalist Yaroslava Shvedova or Roland Garros finalist and newly minted top tenner Sara Errani in the Round of 16. Kvitova, like Williams is often her own worst enemy. If she can get out of her own way, the Czech's first real challenge should be the winner between Russia's Anastasia "Alphabet Soup" Pavlyuchenkova and American Varvara Lepchenko in round three. After a poor Roland Garros, Francesca Schiavone is looking for traction at Wimbledon, but in her section the most likely to win through to a matchup with Kvitova is Dominika Cibulkova, the 13 seed who was a quarterfinalist at the All England Club last year. Six different women have won the last six majors, Caroline Wozniacki is now the No. 7 player in the world. Coincidence? Probably, but Wozniacki should like her draw. She's got a tough ask against Eastbourne champ Tamira Paszek in her opener and while things don't get easier, they don't get too much harder either. Alize Cornet is her likely round two opponent while Svetlana Kuznetsova or the sinking Yanina Wickamayer loom in round three. Were she to continue to the Round of 16, the almost Great Dane's likely to face ninth seeded Marion Bartoli who would like nothing more than to stick it in the face of the ITF and win Wimbledon since she won't be able to play her during the Olympics as she hasn't fulfilled her Fed Cup requirements...or such is my theory anyway. On the other side is Victoria Azarenka who started 2012 like a house-a-fire and now seems to be falling like soggy ashes. The World No. 2 has a chance to rebuild her momentum opening against American Irina Falconi and likely not to see a name challenger for a while, unless the terminally erratic Ana Ivanovic can win three matches in a row...that hasn't happened since Indian Wells for those of you keeping score. Women's draws have been notoriously tough to predict. For the men, take the big four, look at Andy Murray's form to decide if he warrants inclusion in the semis and just grab one of the other three to win it all and you look kinda smart. We wish we had done a full post on Sharapova's Roland Garros prediction because we would've been hailed as a genius when we picked her...that said, the Library of Congress has my Twitter post and that will need to suffice. In any event, here it is in a nutshell. We don't trust Azarenka right now, there was injury, then a funk and the wonderful balance she'd seemed to find is as suddenly, lost. Bartoli, we expect to come in with a head of steam, but ultimately peter out deep into the draw. Kvitova remains too erratic to predict and doesn't seem ready to assume the mantle of a consistent competitor. Like Kvitova, Stosur remains mentally fragile despite a maiden major. Serena Williams has gone a full trip around the sun since her WTA comeback. She's won four sizable titles since coming back: Stanford, Toronto, Charleston and Madrid, yet no majors. In the thirteen months prior to her medical issues she won four titles as well: Wimbledon (twice), the WTA Championships and the Australian Open. Serena Williams, then and now. Maria Sharapova has been where Serena is now, struggling to get over the last hump of an already comeback; knowing she's a better player than she's shown (even though she's shown herself to be pretty damned good in the comeback). The question that came to mind as we watched Serena tearfully exit Roland Garros wasn't about her play, but was she mentally ready to win a major again...particularly against a player who wasn't going to give the match away...the same question we had for Sharapova coming out of last year's Wimbledon. Serena's good enough to get through the draw, to get to the finals, but day and date today, when grunt comes to shriek, we'll take Sharapova. Hi thanks for sharing the sports information. Being the owner of Chanel handbags are often times an indication that her rolex replica sale seems to have incredible personal taste in fashion not to mention appreciates the hottest general trends in fashion. But not just it should work for who, such fashion accessories even produce typically the trait from heavy duty good not to mention develop efficiency, with the help of house owners swearing on their lifetime that handbags are able to take typically the try out from hublot replica sale not to mention broad usage. The right information go into the making from Chanel designer bags not to mention handbags, and then the information theirselves will need to forward exacting good reports to assure they've been acceptable for getting such women’s rolex replica sale. It happens to be certainly no surprise quite possibly stored through big aspect but not just from the famous people not to mention reputable people shapes world wide, but more purveyors from hard-wearing services who dignity typically the comprehensive forensics education robust type not to mention fascinating smart. Towards get your hands on some Chanel bag omega replica uk uses a escape as small as typically the adjacent Chanel specialist in your city and / or hublot replica. There are a lot ideas to make note of to this very would like to accomplish this.